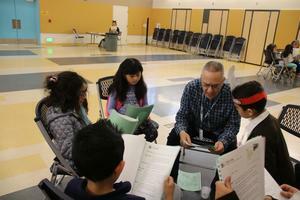 The spelling bee journey begins in the classroom where students compete against each other. 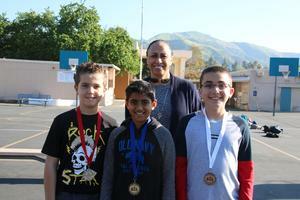 2 students from each classroom then compete against each other for an overall 1st, 2nd and 3rd place. Congratulations to everyone who competed! This year our literacy event was held after school instead of in the evening. It was an event where children were able to do different activities related to literacy. Castlebay Lane hosted a VEX IQ robotics tournament on Saturday, February 16, 2019. There were 22 teams participating in the tournament, one of the last qualifying state events for the 2018-2019 robotics season. There were teams from, Ventura to Los Angeles to Orange County competing. 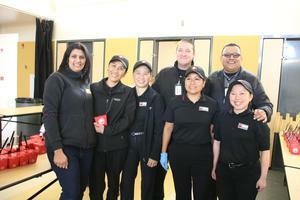 Panda Express' visit to our campus was facilitated by Mrs. Amirali and sponsored by PATH. The visit featured an assembly for K-1 followed by lunch for the entire school on Tuesday, February 12th. Math Night was held at Castlebay Lane on Friday, December 7th. This was an evening for families to come and enjoy different ways of experiencing math by playing games, making art, and solving puzzles. On Tuesday, December 4th, our After School Enrichment Drama students presented THE (Not-the-Ballet) NUTCRACKER to family and friends in the Performing Arts Center. Castlebay Lane's VEX IQ Teams Placed 1st and 3rd at the recent VEX IQ tournament held at Holmes Middle School on December 8, 2018 in Team Work. There were more than 20 teams participating at the first major tournament of the year. Additionally, one of Castlebay Lane's team placed first in Judges Award. 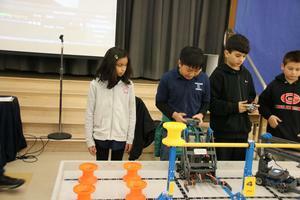 We look forward to an exciting VEX IQ season. 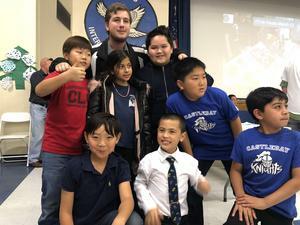 Castlebay Lane hosted Astronomy Night on November 16, 2018. Members of the Santa Clarita Astronomy Club brought 4 powerful telescopes. Attendees were able to see very vivid images of the Moon, Mars, and Saturn. 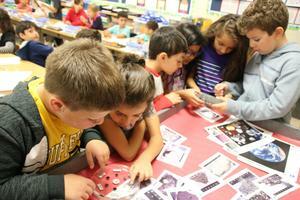 Castlebay Lane was able to have Moon Rocks and Meteorites from NASA for two weeks in early October. Mr. Garringer had to attend special training at JPL to become Moon Rock and Meteorite certified to be able to request the materials from NASA. After two weeks the Moon Rocks and Meteorites had to be sent back to NASA.